35 years of providing over $40 million to North Florida in order to directly treat thousands of severely at-risk children and families. 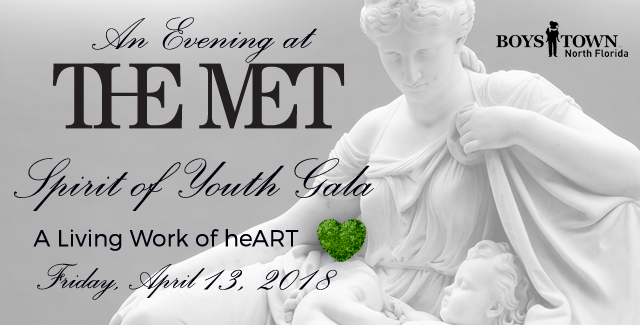 Boys Town of North Florida invites you to the 15th annual Spirit of Youth Gala at the University Center Club on Friday, April 13 at 6:30 p.m. “A Living Work of heART” will transport you to the Metropolitan Museum of Art for an evening of impressive artwork, fine dining, live entertainment and auctions — all in the spirit of supporting youth in this community. Peruse contemporary art and fashion that’s up for bidding while sipping city-centric cocktails and dancing the night away to a DJ while supporting a worthy cause. The 2018 Spirit of Youth Gala celebrates a century of help for every child, strength for every family and hope for every community. This year’s event honors the resilience of the children that Boys Town of North Florida has served and the generosity of its benefactors and volunteers. Boys Town of North Florida is a leader in the treatment and care of abused, abandoned and neglected girls and boys. With more than 100 years of experience, this nonprofit, nonsectarian organization has provided our children with a safe, caring and loving environment where they gain confidence to heal and learn skills to become productive citizens. For 35 years and with the support of generous donors, Boys Town has provided over $40 million to North Florida in order to directly treat thousands of severely at-risk children and families. In 2017, 3,430 children and families in North Florida received assistance though Boys Town of North Florida’s Integrated Continuum of Youth Care Services — including 1,061 children who received direct assistance from Boys Town of North Florida’s Treatment Family Services and Child and Family Support Services. For more information, visit www.boystown.org/north-florida or contact Dena Strickland at dena.strickland@boystown.org or (850) 504-5007.